Sukenari is a small blacksmith shop based in Toyama Prefecture, which is located in the center of Honshu, Japan. The company has been in business for two generations and is widely known for their excellent work using quality steels with impeccable grinds. The last time we were in Japan we had the honor of watching these master blacksmiths create their works of art�a highlight of our trip to be sure. 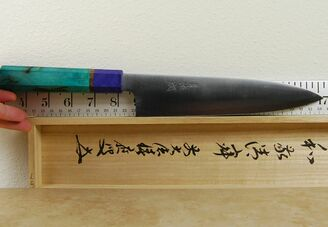 This stunning work of functional art is made from one of our favorite steels, Aogami Super (or AS). The core AS steel is hardened to a reasonably high HRC rating of 63-64. 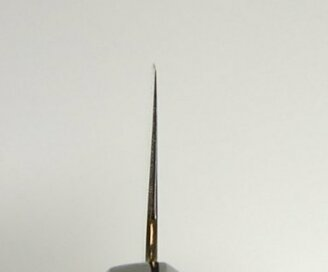 This great alloy is capable of receiving a really sharp edge and retaining it through long sessions on the cutting board. 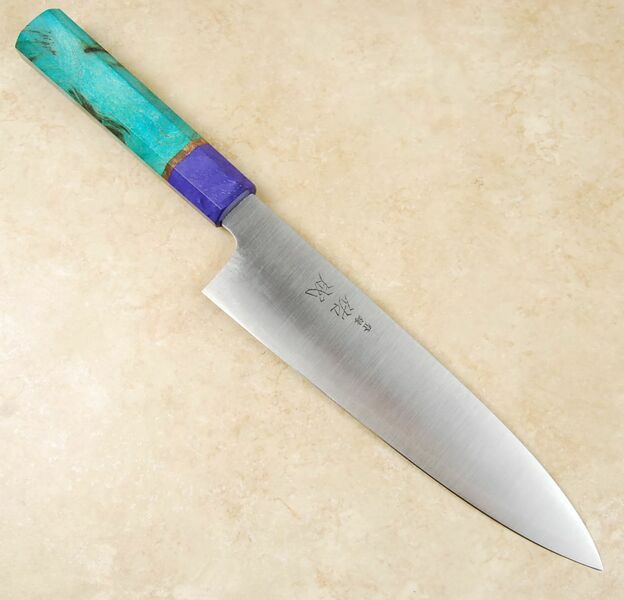 Sukenari grinds the blades with a profile that features a generous height at the handle and a fairly flat area at the heel for chopping. There is a gentle belly for rocking and a lovely thin pointed tip for detail work. The edge grind is sharp right out of the box and features a 50/50 profile. 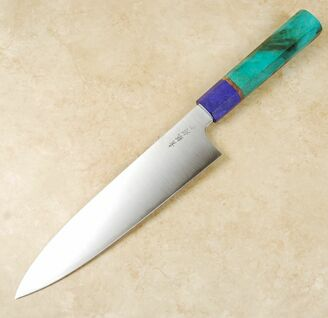 The hairline finished knife is mated to a beautiful custom octagonal handle made of dyed and stabilized buckeye burl. This is a high quality offering from one of Japan�s leading small makers.